Did you see the music video Hymn for the Weekend ? Beyonce henna was so beautiful we had to do an homage I see this becoming a popular design, so I figured we would start practicing . Any other henna artists excited? I wonder what show we will get to see for the Beyonce and Coldplay Superbowl halftime show. If you would like to make your appointment to get a henna tattoo, Beyonce henna style, send me an email to set up your private appointment. Henna is an all natural dye for the skin. Henna is extracted from the Lawsonia inermis tree by drying and grinding leaves and stems. The greenish powder, when mixed with an lemon juice, makes a temporary red, brown, or orange design on a porous surface. Indian families use henna in ritual skin painting, called Mehndi, for birth and marriage celebrations. Arabic and Turkish cultures also use henna. Western cultures have adopted henna to make temporary tattoos and organic hair dye. The Lawsonia inermis grows in hot, arid regions like North Africa and India. For centuries, people ground the foliage of the plant into a powder to dye cloth and skin. The strong pigment, lawsone, actually temporarily stains the skin. The dye is a dark pigment, but does not alter the surface permanently. 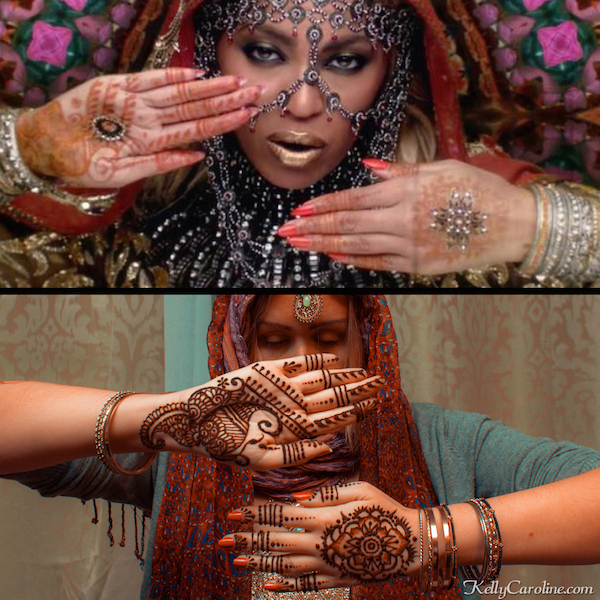 Want to see more Indian inspired henna designs like Beyonce’s? See our Henna Bridal Designs gallery.